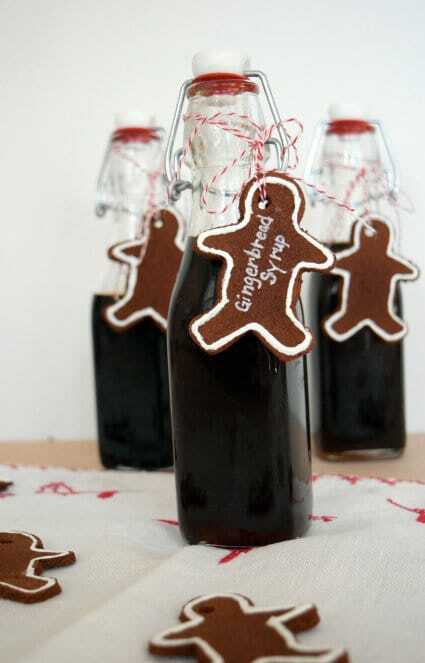 Easy to make Gingerbread Syrup makes a great gift for the coffee drinkers in your life. I am not normally a coffee drinker, but I'm thinking that's all about to change. Since forever, I've made my son ‘steamed milk' with coconut oil, chai spices (made by dear friends of mine) and honey to have with his breakfast on chilly mornings. We don't have an official ‘steamer', so I use my emulsion blender to whip a foamy topping on the hot milk mixture. He chooses to not eat lunch at school (ugh), so I try to get as many healthy proteins and fats in him as possible to hold him through the day. That's my rationale, but Terry thinks I'm just spoiling him. In any event, when I was last at Sur La Table (aka Mecca), I picked up some Pumpkin Spice Syrup thinking it'd be a nice change from the chai spice for him. But as is typically the case with my picky eater, he's not so fond of the Pumpkin Spice Syrup (story of my life). This morning I made his ‘steamed' milk using a Gingerbread Tea bag from Celestial Seasonings and it was really pretty tasty, but light on the Gingerbread taste I was hoping for. Lightbulb Moment!!!! I decided I would make a Gingerbread Syrup that I could add to his ‘steamed' milk as I did the Pumpkin Spice Syrup. This gingerbread syrup is so easy to make. Simple syrup (sugar and water), molasses and gingerbread spices (ginger, cinnamon, nutmeg, and allspice) simmer down to a thick, spicy gingerbread syrup. And let me tell you, this gingerbread syrup is so yummy. Not only will we be using it in coffee, tea, steamed milk, ice cream, and oatmeal at home, but it'd be a great gift for your favorite coffee drinking friends and family! For gifting purposes, I made some cinnamon ornaments (using Martha Stewart's ‘recipe' which is different from many as it includes glue) and used some white puffy paint to outline the gingerbread to mimic icing. I wrote on the ornament using an extra-fine white oil-based Sharpie. Don't forget to punch a hole with a straw before you bake your gingerbread men. I made about a dozen of these gingerbread ornaments and I'm going to save a few to write the names of our family members on for re-usable gift tags. So if you're looking to spice up your coffee bar or to make some easy gifts for friends, family, teachers, or any other coffee lovers, this gingerbread syrup surely fits the bill. Not only is it perfect on its own, but you could add it to a basket with coffee beans and a mug if you needed to up your gift game. I know these 8.5 oz bottles are available online at Amazon for $24.99 for a set of four. I've included a convenient link below to take a closer look if you're interested. They are very handy to have around the kitchen and ideal for use with things like salad dressings, marinades, etc. 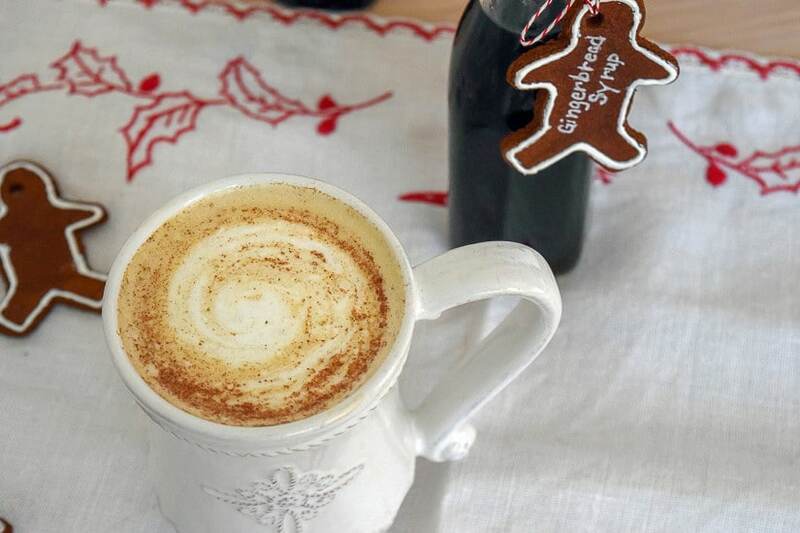 Pin this gingerbread syrup recipe for your future reference! Yum! And I love how you bottled & labeled them. So pretty. Thanks Sarah! I’m pleased with the way they turned out. It’ll be fun to give them as gifts. Wow! I love this idea– it looks amazing!!! Thanks for linking up! #bestofblogs Pinned! Thanks for stopping by Julie. Looking forward to your next Link Party! NCBN Rocks! Thanks Andrea! I’m looking forward to gifting them. Lynn! This is fabulous! I pinned it already cause I’m gonna make it. I love all kinds of flavours in my coffee, especially pumpkin spice, but now with the holidays, gingerbread syrup would be just amazing! I know I’m going to love it! Also, as usual, your fotos are just lovely! Do you think, I could substitute molasses for honey or maple syrup? I don’t get molasses here. What do you think? Thanks & have a great night….did you watch WD already??? No Molasses in Spain? Whats up with that? I’m sure you could sub either honey or maple syrup and it’d be perfectly fine. Another option would be to add dark brown sugar for that molasses-y flavor. If you have dark brown sugar, I think that’s what I would do. Did not watch WD yet…don’t tell me anything! This looks so, so good! Oh, and the little gingerbread tags are the cutest, too! I have never heard of gingerbread syrup, I need to try this! Hi Carrie, it’s quite delicious! And it makes the perfect gift. Please do give it a try and thanks so much for stopping by to visit today. I was already planning to make this as a gift. Lucky I came across your recipe. How much does this recipe make? (I’m looking to fill (6) 5 oz. bottles. Thanks! Hi Danielle,by the time you simmer it down a bit, it reduces to about 1 cup. I’m so glad to be able to help you. And you need to make the little gingerbread men as well…if for no other reason than they smell so great, even 2 weeks after I made them. Thanks for stopping by and visiting today! Ok, I’m just going to come out and say it. I’m so jealouse of your creativity and talent in pairing flavors and your photography! I have so much work to do! I saw this on Bloglovin’ the other day and I Pinned it then, I am Pinning again cause I think everyone needs to make a bit of this for their Christmas Season. This just screams magic, cozy and fun!! Or, can I just come live in your cozy, magical home??? Pretty please????? Aw Nikki, thanks for your very kind words. I can always count on you to boost my confidence. And thanks for sharing my ‘stuff with your pinterest pals! Right now my ‘cozy, magical home’ is in happy chaos…I’ve been making garlands for my front porch and there’s glitter and ‘crap’ EVERYWHERE. Goal for today…finish and clean. And I might need a dose of gingerbread syrup in something other than coffee to get it all done? Thinking of you and your crew during this season. Those are ADORABLE!!! I love the gift tags! What a great idea and thank you for including the resource for the bottles. My husband and I have recently made a brandied chestnut sauce and poured that over ice cream. This would be such a great present! Thank you! Brandied Chestnut Sauce?! Holy cow…that sounds awesome! You must share that recipe…please. The tags and the syrup are so easy to make. I’m so glad you noticed that the recipe doesn’t note the amount made…could’ve sworn I had that on there! Anyway, it depends on how long you simmer it down. I feel you get the best flavor when you simmer it down to a cup, so that’s what the recipe as written will make. Oh, I forgot to ask— how many bottles will this recipe make? Thanks! It will make one cup of gingerbread syrup, so it depends on your bottle size. What an interesting idea this is! Hi De…I would say 1/4-1/2 tsp. Maybe try the 1/4 first and then add a bit if you think it needs it. If you get a chance, do pop back and let me know what worked for you…I’d love to know and share it with everyone else. Hope you have a fantastic day my friend. I think I did approx 1/4 tsp nutmeg, but that I did grate fresh, so it’s hard to measure. Otherwise, I did it according to your recipe (my molasses is blackstrap) and it came out perfect! So delicious! Thanks for sharing what you did! It is quite tasty isn’t it? I need to whip up a new batch for the holidays.